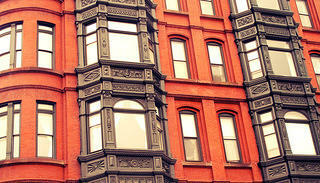 Windows are the most visible, yet most commonly underappreciated, components of older and historic homes and buildings. In addition to adding beauty and character, original windows serve a great purpose—they connect the outside of the building to the inside and, as an integral part of the architecture, offer invaluable clues to a building's history. Despite this value, however, historic windows often get the blame for a building’s energy loss. Most often, people jump to replace their historic windows because a) companies promise that their replacement windows will save clients time and money, and b) it’s promoted as the "green" thing to do. In fact, a thriving industry has grown around this perceived need to replace rather than restore. A report from our Preservation Green Lab in Seattle, Saving Windows, Saving Money: Evaluating the Energy Performance of Window Retrofit and Replacement, tackles this misperception head-on. The study examines multiple ways you can retrofit (read: modify) your historic windows for better performance, and outlines each option’s energy, carbon, and cost savings across a variety of climates. The heartening result: Retrofits for historic windows perform comparably to new replacement windows, and almost every retrofit option offers a better return on investment (at a fraction of the cost). For more facts and figures, we encourage you to read the full Preservation Green Lab report. In the meantime, check out the top 13 things you should know about retrofitting your historic windows—and don't miss our shareable slideshow at the bottom of the page. Include retrofitting in your cost-benefit analysis. Are my windows an important architectural or defining feature of my building? Are there ways I can retrofit my windows to achieve greater energy efficiency? Will replacement windows last as long as my originals? Are there more cost-effective approaches available other than replacement windows? Will replacement windows fit the character of my property or detract from it? Tackle other energy-efficiency measures first. Just as windows are a part of your whole house, so should they be part of a whole-house solution to cutting back on energy use. First do an energy audit of your house, preferably with an experienced professional. They can help you evaluate energy-saving solutions, the proper order for implementing them, and estimated costs. Then consider what additional efficiency gains or energy savings retrofitting your windows can offer. Retrofits for historic windows perform comparably to new replacement windows, and almost every retrofit option offers a better return on investment (at a fraction of the cost). Retrofits have better returns on investments than replacement windows. Window retrofits such as cellular shades, storm windows, and insulating shades can achieve energy savings comparable to replacements at a much lower cost. Interior storm windows also reduce potential exposure to lead-based paint, while exterior storm windows help extend the useful life of historic windows by offering protection from the elements. In comparison, replacement windows may offer high energy performance improvement, but the upfront costs are substantial and are not rapidly recovered through savings in energy bills. The range of energy performance for retrofit options varies significantly. The highest performing retrofits include interior window panels, exterior storm windows, and combining insulating shades with exterior storm windows. The performance of these measures varies significantly depending on the climate in which they are installed (see next tip). Weather stripping was found to have the lowest energy cost savings and a low average ROI relative to other window improvements. However, the study determined that when homeowners install the weather-stripping themselves, it produces a higher return than any of the other window options studied. The best retrofit option for Phoenix may not be right for Chicago, given the difference in their heating and cooling needs. For example, in places like Chicago that rely more on heating, insulating cellular shades helped reduce heat loss (even more so if the window also had exterior storm windows). Meanwhile, if you’re in a place that relies more on cooling systems, like Phoenix, consider whether exterior shading, such as overhangs, trees, or nearby buildings, is present. If these elements are already shading the windows—or if windows are not oriented toward the sun—the windows will receive minimal or no cooling benefit from a retrofit. 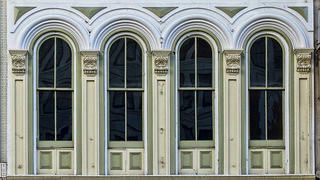 Historic windows in St. Paul, Minnesota. Perform high-return, do-it-yourself installations first, where possible. Weather stripping (good for old, drafty windows) and interior surface film (good for homes with big cooling bills) generate immediate savings at a low cost and don’t prevent you from adding other cost-saving retrofits later. Taking a phased approach to window upgrades—focusing on the highest returns first and using savings to pay for future improvements—can eventually lead to long-term savings of money, energy, and carbon emissions for older homes, even for households that are on a tight budget. Saving existing windows is greener than producing new windows. Keeping existing windows saves the energy and resources needed to create new windows. Like any product, the production of replacement windows requires materials, and these materials generate CO2 and other environmental hazards from the extraction, manufacture, transport, and disposal processes. Retrofit measures also require materials, but are often less materials-intensive and so impact the environment less than an entire window replacement. Saving windows preserves a home’s character. Historic windows were custom fit to their original openings and often have sizes and shapes not found today. Replacing them usually requires changing the size and/or shape of the opening. So while standard-sized new windows might save on operational costs, they’ll compromise the character and historic integrity of a home with smaller windows, less light, distorted proportions, and trim that doesn't match the opening. Moreover, changing the opening’s size or shape decreases the chance that new stock replacement windows will fit well. The resulting gaps around the windows will be just as (if not more) drafty as the historic windows they’re replacing. Tip: The Secretary of the Interior’s Standards for the Treatment of Historic Properties and The Secretary of the Interior’s Illustrated Guidelines on Sustainability for Rehabilitating Historic Buildings can guide you on how best to approach the preservation of windows in historically designated homes, or homes that may be eligible for listing. 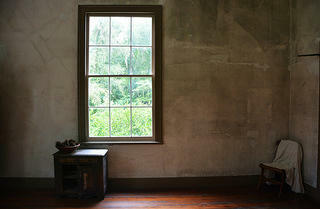 A window in the Haile Homestead near Gainesville, Florida. Older windows are built with high-quality materials. Wood windows made prior to the 1940s are likely to be made from old growth wood—a stable, dense wood that mills well, holds paint and stain well, is not as attractive to insects, and has natural rot resistance. Also, the wood was most likely harvested locally, making it better suited for local climate conditions. Older windows can be repaired. Traditional windows are made from individual parts. Each piece—the rails, stiles, muntins, stops, sill, stool, jamb, etc.—can be individually repaired or replaced in kind. Vinyl, aluminum, fiberglass, and composite windows are manufactured as a unit, and the components generally cannot be repaired. When a part fails, or the insulated glass seal breaks, or the vinyl warps, the entire unit must be replaced. Bonus benefit of older windows: Repairing and increasing the energy performance of existing wood windows is good for the local economy, as hiring a window repair specialist to refurbish windows creates skilled local jobs. So, as you can see, historic windows have a lot going for them, and the more you understand what options are available for improving them, the better you can protect your building’s character—and your wallet’s health. Read the Preservation Green Lab report to learn more. For a more detailed report summary, check out Preservation Leadership Forum's post Old Windows Are Worth It. The updated slideshow was prepared by Sarah Heffern.